A: Hydrogen Sulfide is a colorless, transparent gas with a characteristic rotten-egg odor at low concentrations. It is not detectable by odor at high concentrations. 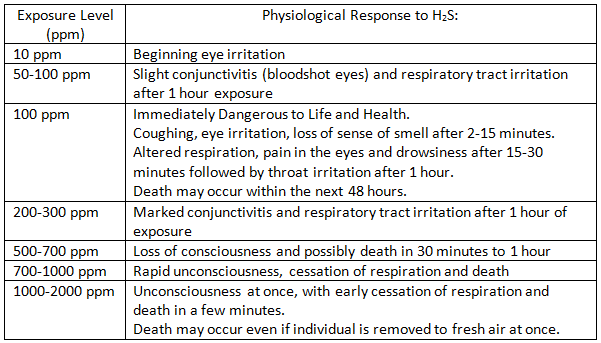 As the level of H2S increases, the sense of smell is lost! Hydrogen Sulfide is a naturally occurring gas mixed with natural gas or dissolved in the oil or brine and released upon exposure to atmospheric conditions. A Short Term Exposure Limit (STEL) is a TLV(R) based on a 15 minute average.